Microsoft Azure is developed by Microsoft as a cloud computing service. It is created to build, test, deploy and manage various applications with the help of data centers managed by Microsoft, globally. With the passage of years, this has become one of the most popular cloud service providers all over the world. These services cater to the rapidly changing and elastic needs of the modern enterprises. Along with these services, Azure supports many other programming languages, frameworks, tools, that include third-party systems. The operating system is popularly known as Microsoft Azure, which helps in running the fabric layer. This fabric layer is controlled by Microsoft Azure Fabric controller, which also manages the features of scalability and reliability. The API of Azure is built on HTTP, REST and XML, allowing developers to interact with all the services that come with Microsoft Azure features. Classic deployment model: individual management of each resource of Microsoft Azure. Azure Resource Manager: users are allowed to create different groups for different utilities for deploying, managing and monitoring various resources. Let us now explore some of the benefits of migrating to Microsoft Azure. Speed is a crucial factor for any business and a key marker for being ahead in the competitive market. Deploying and implementing Azure is fast and easy. It allows businesses to speed up the operations and become more scalable. With the help of Microsoft Azure, businesses can have faster development cycles than that with on-premise solutions. This implies that during the phase of development, they could get a more responsive feedback and can be iterative; allowing the businesses to explore the outcomes of technologies according to their respective business objectives. Business agility is not only about maintaining the standards but also about growing in a quick manner. Azure facilitates the users to have an integrated development environment, i.e. Visual studio. It has reduced the extra efforts to be put by the developers in learning a completely new platform. This would also avoid the developers to face the mismatch of skills, and the teams can easily deploy Azure while learning it on the job. Disaster recovery can’t be coined as a business critical option, but if a company has to remain away from its data, it could lead to adverse consequences. The main focus of the companies is on the outcome of the business. With the use of Azure, an organization can make sure they are compliant with various norms, such as GDPR, HIPAA etc. This would help them aim at the outcome, rather than focusing on the hindrances that could arise in the business process, like data protection. Microsoft has built Azure stack to give enough freedom to the companies, to select where their data should reside. If they already have Azure’s pure cloud solution, this transit could become very easy. After knowing what are the benefits of migrating to Microsoft Azure, let us now explore what is trending in Azure technology. Cloud offers such environment that can suit various industry requirements. Most of the customers, who shop for various services of cloud, say that they end up choosing technology over price. This is because, with Microsoft Azure, it is possible to have an all-in-one combo pack – cloud, which is user-friendly, productive and cost-effective. Well, Azure is continuously improvising, keeping itself on top of the competition. Let’s now have a glance at some of the trends that would be popular in 2018. There has been growing demand of Artificial Intelligence and Machine Learning among the enterprises. These are eminent cloud computing trends in 2018, as they can boost the productivity of the enterprise. With Azure’s Machine Learning services, organizations would be able to build smart solutions and leverage their growth. IoT is one of the strongest cloud computing trends in the recent scenario. As more and more people are using smartphone or tablets for accessing the internet, IoT is the top-notch topic that is being sought after by the companies for various business processes. Microsoft Azure has come up with the location-based services for facilitating the development and deployment of various apps and services. Moreover, Microsoft has allowed access to Azure IoT Hub Device Provisioning services. These services when functional would allow the customers to configure device provisioning and automate the process. From the very beginning, Azure has been really easy to use. Azure is continuously improvising on accessibility to migration and various other services. In the months to come, we would be able to experience Azure becoming more robust and efficient. Also, the solutions would be cost friendly and trustable. Azure’s cloud is considered as the most trustworthy cloud in the market when coming to the security. It offers options for encryption and compliance, which has made millions of customers, trust its services, including U.S. Government. The technology is evolving rapidly and with it, the threats. Security has become one of the most talked topic of 2018. Azure offers single sign-on and stringent authentication processes for Azure’s Active Directory, Advanced Threat Analytics, and Microsoft Authenticator, with the help of which Azure is leading the industry in the cloud market in terms of security. Microsoft has introduced Azure IoT edge, which is a software platform built to offer cloud services to edge devices. This enables easy orchestration between the code and service. Edge computing has become quite popular with the enhanced usage of internet devices and growing technologies. 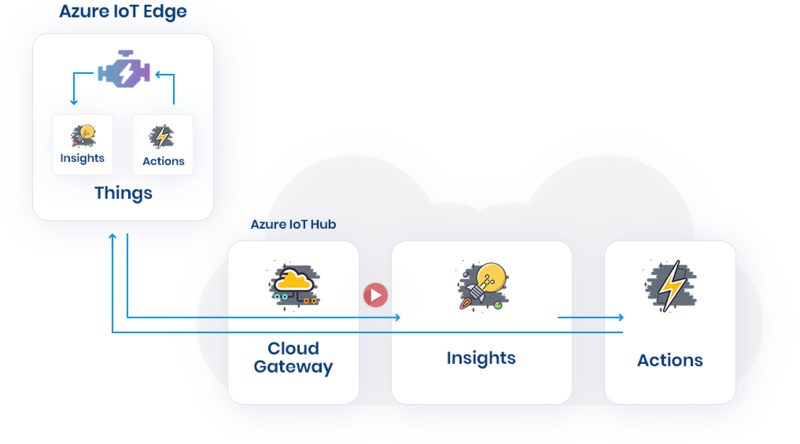 Microsoft Azure has efficiently featured IoT edge to benefit the companies, by doing more in the minimum amount of time. This article provides a brief summary of the benefits of using Azure along with the trends that are to be looked upon in 2018. The different enterprise-grade cloud features offered by Azure makes it the preferred cloud service provider for many large businesses. The target architecture can include specific features based on the respective requirements and needs of an organization. While making a transition to the cloud, businesses or organizations might seek out alternatives, which could be easier to implement with their existing on-premises deployments instead of services provided by Azure. At Multidots we can assist organizations in the migration to cloud services, which could leverage the existing expertise of the business. If you have anything to talk about trends or how Azure could be beneficial to the organization, feel free to start a conversation.